Lovingly crafted beauty for your home, work, and self. There. I said it. Mentally flog me if you must. But it’s what I grew up with and I LOVE jarred sauce (Prego Roasted Garlic and Herbs, specifically). However, despite the jarred sauce and the boxed pasta, there’s one thing I absolutely always make by hand…the meatballs. Two-bite, tasty little savory morsels of heaven. I am hard-pressed to not gobble a meal’s worth of these little beauties up as I’m making them, so I usually make them in a huge batch, both to ensure there are plenty, and to prevent my kitchen from getting horribly greasy too often. Again, I’m not Italian, but I don’t think my creations would offend too many. Note that I don’t use Italian sausage in my recipe. That’s just a preference on my part. Italian sausage tends to be flavored heavily with sage and/or fennel, and I’m not a fan of either. If you like that flavor, replace some of the ground beef with Italian sausage and adjust the seasoning accordingly. 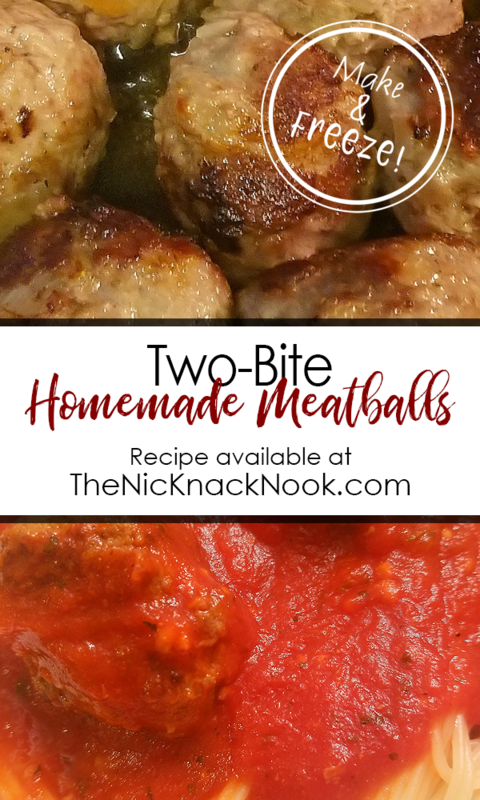 Granted, you can buy frozen meatballs at a much cheaper cost than this, but I’ve never found any that taste anywhere near as good, so it’s homemade all the way for us. Plus, these freeze GREAT, so make a huge batch ahead and just throw a few in the saucepot as you cook your pasta so you have an easy, weeknight dinner. How about you? Do you make your own meatballs/sauce/pasta? What’s your favorite recipe? Sauté the diced onions in 2 teaspoons olive oil on medium heat until golden and translucent. Let cool. Place ground beef, and all other ingredients, including cooled onions, in a large mixing bowl. Mix very well with your hands. Take a tiny bit of the meat mixture and cook in the skillet until done and taste for seasoning. Adjust if necessary. Roll meatballs between hands. To make two-bite size meatballs, I use enough to make a meatball about 2 inches in diameter. However, you can roll them as big or as small as you wish! Place a large skillet on the stove over medium heat. You can use the pan that you sauteed the onions in, just be sure to wipe it out with a paper towel so you don’t get burned onion bits stuck to your meatballs! 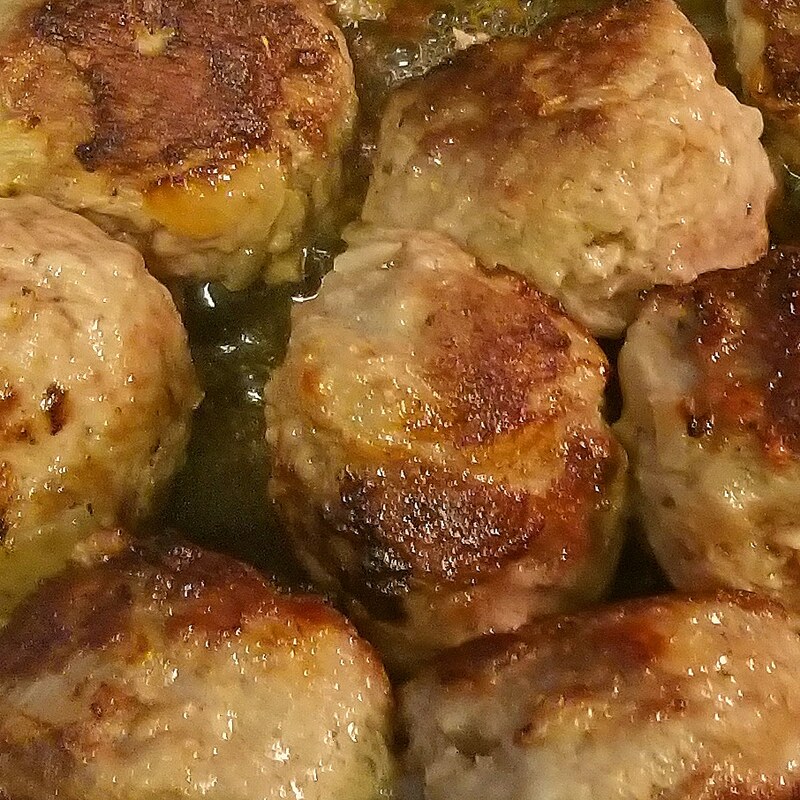 Allow to come up to temperature before placing meatballs in the skillet. It’s okay if they touch, they will shrink up a bit as they cook, but don’t let them be squeezed in. Cook over medium heat until brown. Use a fork to gently roll them over to brown each side. When they feel firm to the touch, remove them to a cookie sheet lined with paper towels to drain and cool. If you have multiple batches to cook, be sure to drain and scrape the pan to prevent unwanted blackened bits from flavoring your meatballs. When all the meat mixture has been rolled and browned, you can either serve immediately or place in a freezer bag to freeze for future use. I usually put sauce into a pot and drop in however many meatballs I need for that night, place the lid on, and bring the whole pot up to a light simmer until the meatballs are heated through. Makes a super easy weeknight meal!